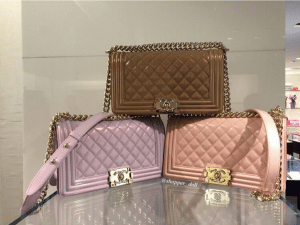 Chanel’s latest Boy Bags for Spring/Summer 2016 Act 1 Collection are made available in Iridescent Calfskin. 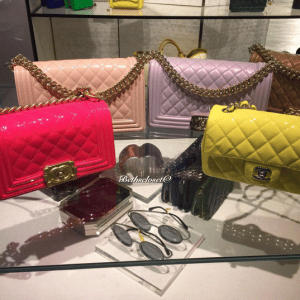 These Boy Bags features a shiny and pearly effect, almost similar to patent leather. It comes in gold hardware which matches perfectly to the iridescent calfskin. It comes in colors like Black, Dark Beige, Light Green, Light Purple, Light Pink and Light Blue. 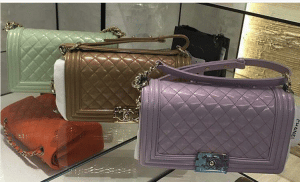 The Iridescent Calfskin is also available in Boy WOC. 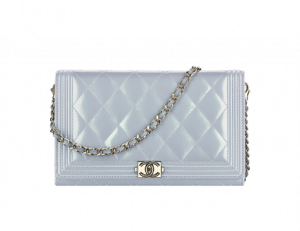 I love the Wallet with Chain, we’re seeing Chanel releasing these kind of bags more often these days. A new version has just been dropped in store and it’s from the Cruise 2016 Collection. 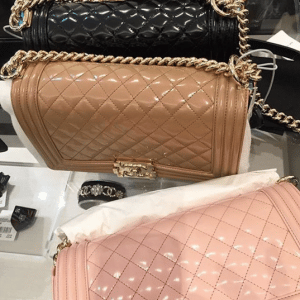 Basically almost an exact copy of the Classic Flap Bag – featuring a stunning front flap with tiny CC on the front, it’s quilted and it comes with a beautiful interwoven chain. The color gold will melt your heart; it represents both luxury and beauty. Because the details are all craftsmanship, any eye can see that is an expensive object. Made from Metallic Calfskin, the chain can be removed anything you want. This bag matches to the season we’re in right now…the winter. And it marries anything from casual to chic, it’s simply crafted for the true lady. Measuring 4.5’ x 7.5’ x 1.4’ inches, priced at €1520 euro via Chanel boutique. What do you think about this bag? Opinion please.